The BIG 3-Ring Circus is back! 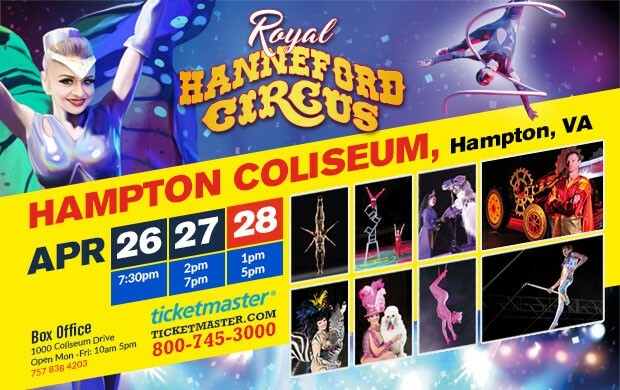 The Royal Hanneford Circus brings a full-production 3-ring circus spectacular to Hampton! Flying trapeze, Jugglers, Clowns, Liberty Horses, Performing Camels, Human Cannonball, and much more! See over 45 performers PLUS the biggest stars of the show… Performing Elephants! And don’t miss the only show in the world today with performing pigs featuring Oink, the singing pig! The Hanneford Family is guaranteed to bring smiles and laughter to each and every audience with their wide variety of high-end acts and talents from all over the world.